Covering 1600m2 of ground floor space this was truly a world class, show stopping stand. Triple deck incorporating a passenger access lift, materials and finishes of the highest level, inverted, suspended vehicle displays, visitor café bars, staff dining rooms and kitchens, test drive facilities and all manner of data collection. All of course executed in the 9 day site construction period. Why such a simple brief? - We were trusted to do the job and know exactly what the brand deserved. The CEO said it best when he commented, "At last an agency that has got our new strategy; someone's got it right!" 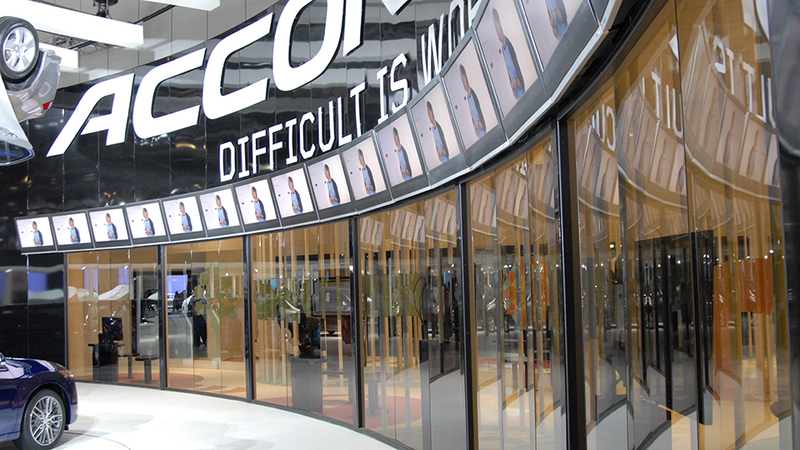 In addition for this client we have provided travertine marble floors, broadloom wool carpetting, "exploded" F1 displays, turntables, Fleet and Franchise lounges and offices, LED display walls, banks of LED's / Plasmas, Product Launches and Press parties and commissioning of staff uniforms. 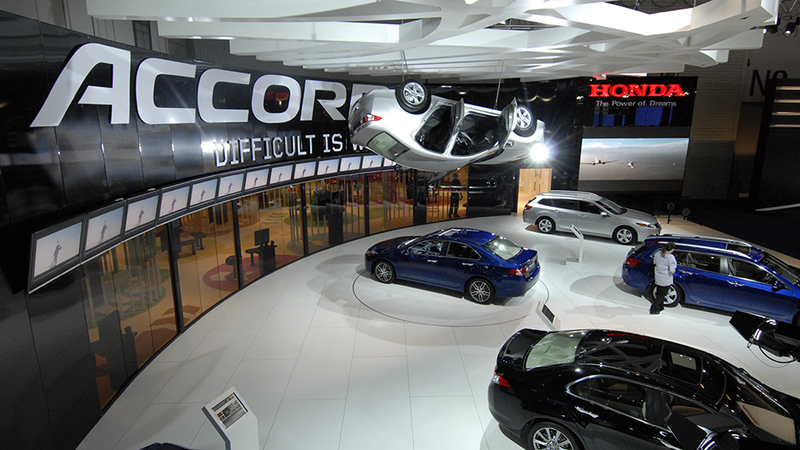 Working in parttnership across all of their brands including Honda Motor Europe, Honda Marine, Honda Bikes and Honda Finance. Just wanted to send you a note to say a HUGE thank you for this year's Motorshow stand, and for all your support before, and during the show. I think Ken [European CEO] said the best words to you "At last an agency who has got our new strategy; someone's got it right", and I think you did. 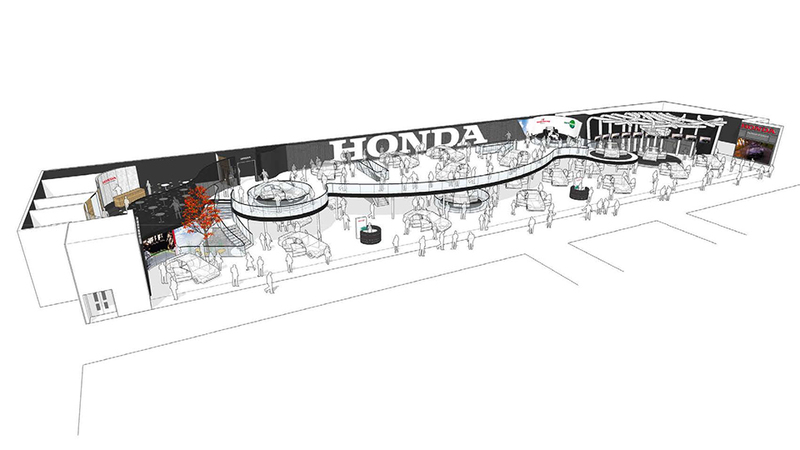 I know all Management at Honda were thrilled with the stand and they have only been receiving good comments from Dealers, Customers, Colleagues etc. etc., about the stand. We've had more comments than ever from all departments about how good the stand was, and the word "Premium" has come out more than once. Our data was outstanding this year, and I know we had a great team, but making the stand work for customers also helps to achieve this. We doubled our test drives from last year, and we based all our objectives on IMIE visitors being up 20%, however they were only up 13.5%, so therefore we exceeded all our objectives with data and test drives. (I think this was something to do with Emma’s help on the reception desk! ).